Alecia Carter is a research scientist with the Centre National de la Recherche Scientifique at the Institite des Sciences de l’Évolution Montpellier, University of Montpellier. 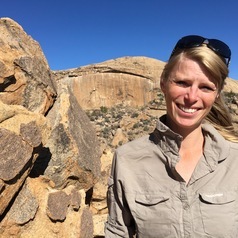 She researches the behaviour of wild baboons in Namibia, trying to understand whether and how information is transmitted through their social networks. She is also interested in open science and the ethics of academic publishing.